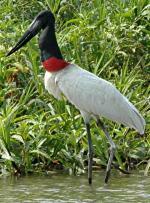 Snowy Egret: Medium-sized, totally white egret with a long slender black bill with yellow lores. The eyes are yellow and legs are black while feet are bright yellow. The head, neck and back have long, lacy plumes during breeding season. 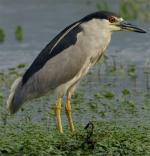 Generally silent and feeds on crustaceans, insects, and fish. 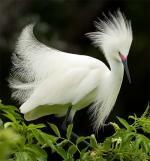 Snowy Egret: Breeds locally from Oregon and California east to New England, mainly along coasts. Spends winters regularly from California, Arizona, and Virginia south to the West Indies and South America. 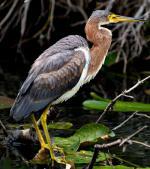 Preferred habitats include marshes, ponds, swamps, and mudflats. The Snowy Egret prefers to breed in large areas of inland and coastal wetlands. Their range extends from the southern Great Lakes and southwestern United States to South America. Breeding takes place in eastern North America on the coastlines of the Atlantic and Gulf Coast, and along inland rivers and lakes. Nests are built in trees and low shrubs, and nesting takes place in colonies. Northern populations migrate to Central America and the West Indies during winter months. Diets consist of fish, crustaceans and insects. 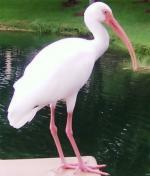 The conservation rating for the Snowy Egret is Least Concern. At the end of the nineteenth century, the beautiful plumes of the Snowy Egret were in great demand by market hunters as decorations for women's hats. In 1886, plumes were valued at $32 per ounce, which was twice the price of gold at the time. They were hunted nearly to extinction before laws were passed to protect them. There is evidence that a pair of Snowy Egrets cannot recognize each other except at the nest. Even there, a bird arriving to relieve its mate must perform an elaborate greeting ceremony in order to avoid being attacked as an intruder. They choose urbanized nesting locations over isolated ones, because isolated locations have more predators. Egrets use flight to escape predation from terrestrial animals and they are known to have innate recognition and avoidance of poisonous snakes. A group of egrets has many collective nouns, including a "congregation", "heronry", "RSVP", "skewer", and "wedge" of egrets.